E-book reader, while being novel, has NOT actually taken the market by storm. But why are all the big names rushing to come up with an e-book reader? If trees are a scarce commodity and the Information Age sees no signs of retreating, it makes sense to produce e-book readers for the future market. A paperless society can be a reality when consumers have no choice but to turn to alternative sources to paper. If everyone owns a mobile phone today, perhaps the e-book reader will be the next gadget to be viewed as a necessity rather than a luxury item for the literate. An e-book reader that can bend is definitely cool and exciting. The only models available in the market today are e-book readers which come with hard LCD displays and inflexible components. Bridgestone, the name synonymous with tires and Formula 1, has got the e-book market into a frenzy lately through its new invention. 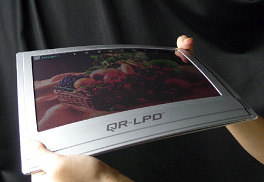 It claims that it has pioneered the design of the world’s first flexible e-book reader. The e-book reader has a 10.7-inch-screen and measures 5.8mm thick, half the thickness of Kindle. It can display color pages and be bent to a certain extent. Both the circuit board and electronic board are flexible. While Bridgestone has announced that it has no plans to commercialize the product yet, the technology is set to make e-book readers more appealing and versatile for users.